It isn’t often that our seaside town makes national news, unless it’s about a professional golfer or a presidential candidate. So I was especially surprised when I came across an article in the May 3 issue of The New York Times about Jupiter High School’s half-century old tradition of an annual junior vs. senior tackle powder-puff game. Supposedly, it is the last of its kind in the nation and was nearly cancelled this year by the school’s principal due to alleged safety issues. Only after parents and the community banded together to provide insurance and rent the school’s football field was the event saved. High schools are no strangers to powder-puff: the tradition of gender role reversal at a school football game. Boys, dressed as cheerleaders, stand on the sidelines, rooting for girls playing in full football gear. However, most schools switched from tackle football to flag football, a no-contact version of the sport. From the 1975 Chieftain Jupiter High School Yearbook: Boys dressed as female cheerleaders show off their school spirit at the 1974 powder-puff game. Not Jupiter High School. For fifty years, female Jupiter Warriors have borrowed football pads and helmets from the boys and ascended on the field for an epic battle between classes. From the 1975 Chieftain Jupiter High School Yearbook: #3 takes off her helmet. If you need proof of powder-puff’s legendary fame in our town, you only need to look as far as my mother’s 1975 yearbook. In the “Seniors” section, on nearly every page, at least one girl lists powder-puff as one of her favorite memories of high school. There’s even a two page spread of the event, from which I’ve included some photos. 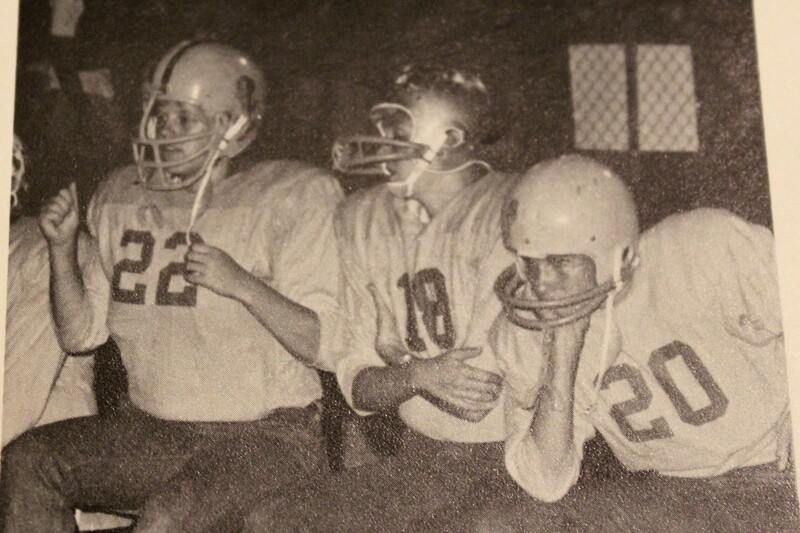 From the 1975 Chieftain Jupiter High School Yearbook: Players on the bench. Readers: Did you participate in one of Jupiter High School’s annual powder-puff games, either tackling on the field or cheering on the sidelines? Can you identify anyone in these photographs? (There are no captions in the yearbook.) Please share your experiences in the comments section below. From the 1975 Chieftain Jupiter High School Yearbook: The huddle. By the time I graduated from William T. Dwyer High School in 2006, powder-puff was a relic of the past. It’s nice to know that Jupiter has preserved its traditions and takes pride in its community school and students. Here’s to 50 more years of tackle powder-puff football!